The Werner Powerhouse FG Whitewater Kayak Paddle offers amazing power and responsiveness needed for big creeks and river running. Full size blades are evenly balanced to create a clean catch that is immediately powerful and smooth through out the entire stroke. This Premium Performance gives you the right combination of light weight, stiffness and durability. The custom-shaped, low profile, reinforcement spine allows for enhanced blade maneuverability when linking several strokes and provides blade stiffness and overall strength. The brightly colored red blades increase visibility on the water. Only gave it 3 stars because of the following issue....We ordered this paddle for my husband who is 6 tall. 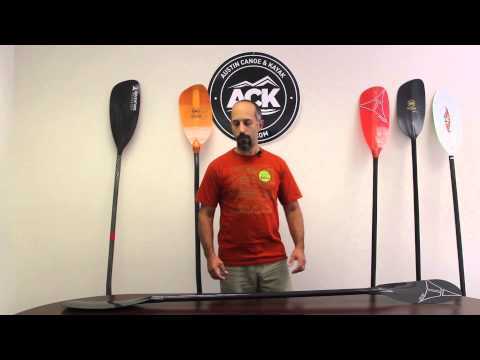 We followed the height/paddle length recommendations on Werners site. It is now my paddle; Im 58. The paddle was too short for my husband in his Liquid logic XP10; his knuckles hit the sides of his boat with every stroke. Werner should take into consideration the owners boat width in their paddle length recommendations. An expensive dissapointment as we ended up having to use the paddle the day we figured out the error hand paddling down the river that day just didnt sound like fun; but not the end of the world. It is a great paddle. We will end up selling it locally so we can order him the correct length. Absolutely great. I can paddle upstream where I never could before. Much better control.